With the political heat on pharmaceutical manufacturers increasing in Washington, D.C., the industry is preparing for a fight over perhaps the most controversial issue confronting it: drug pricing. As many of the industry’s largest companies increase the prices of their products, they have also increased their lobbying spending on Capitol Hill, and some have reported lobbying on drug pricing in particular, as well as on specific bills that attempt to rein in the problem. There are also more companies lobbying on this issue than ever before. The industry’s biggest trade group has also increased dues for its member companies by 50% in order to raise $100 million for an influence campaign to stave off possible pricing regulations by U.S. lawmakers. In this report, Citizens for Responsibility and Ethics in Washington (CREW) examines how the pharmaceutical industry’s lobbying activity has responded to the growing possibility that legislators may take action to rein in the cost of prescription drugs. First, we explore the size of the drug pricing lobby by examining lobbying records for mentions of drug pricing and other similar search terms. We found that lobbying on this issue has dramatically increased over the past decade. CREW found 153 different companies and organizations that reported some variation of the term “drug pricing” on their federal lobbying disclosures during the first three quarters of 2017. This number has more than quadrupled over the past five years. Twenty-two of Forbes magazine’s top 25 largest drug and biotech companies in the world were found to have lobbied on some variation of the term “drug pricing.” Collectively, these 22 companies spent more than $80 million on lobbying during this period. Second, CREW explored how the pharmaceutical lobby works by examining the lobbying activity around a number of bills that were aimed at controlling drug prices. Many of the nation’s largest pharmaceutical companies hired lobbyists to oppose these bills. Thus far, they have stalled in committee or gotten little traction on the House or Senate floor. We also examined how Big Pharma utilizes the “revolving door” between government agencies and lobbying firms to push back against new regulations. These cases revealed that because of the industry’s lobbying power, it is incredibly difficult for the government to implement meaningful reform. Finally, we briefly discuss two critical non-lobbying tactics that Big Pharma uses to influence policymakers: public relations and campaign spending. The pharmaceutical industry has made record profits while millions of Americans struggle to pay for medications that are critical to their health and well-being. As the federal government attempts to address this issue, Big Pharma has shown that it will use its considerable resources against any reform efforts perceived as a threat to its bottom line. While it remains to be seen whether the government will be able to find a solution to rein in drug prices, the drug industry is sure to do everything it can to stop them. In May 2016, representatives from major pharmaceutical and biotech investment funds called a meeting with prominent industry lobbyists and executives, and told them to do a better job defending their pricing practices. According to Bloomberg, the fund representatives warned that failing to adequately defend their pricing methods would open the door for lawmakers to propose regulations. In anticipation of a legislative push, the Pharmaceutical Research and Manufacturers of America (PhRMA), the trade association representing the country’s largest drug makers, increased dues for member companies by 50% in 2016 in order to raise an additional $100 million that could be used in a drug pricing battle. Clearly, Big Pharma is preparing for a fight over drug prices. In 2017, PhRMA reported lobbying on “prescription drug costs/pricing” and “legislative issues related to access to pharmaceuticals” among several other topics. It also reported lobbying on more specific pricing topics such as “issues relating to Medicare Parts B and D” and the “340B drug discount program” which requires drug manufacturers to provide medications to health clinics and hospitals in low-income areas at steep discounts. PhRMA has also been successful in preventing pricing transparency proposals from becoming law at the state level. The pharmaceutical industry has had a robust and organized lobbying operation on Capitol Hill for years. Over the last decade, Big Pharma has spent roughly $2.5 billion lobbying the federal government on a broad range of issues, including efforts to limit drug prices. The industry allegedly promised to support President George W. Bush’s 2006 Medicare Part D plan on the condition that the Centers for Medicare and Medicaid Services (CMS) would be forbidden from negotiating for lower drug prices. In 2009 and 2010, during the negotiations and horse trading leading up to the passage of the Patient Protection and Affordable Care Act, more commonly known as “Obamacare,” the industry allegedly made sure that the new law would not include any proposals that would reform how prices are set for prescription drugs. These types of results don’t come cheap: in 2017 alone, the pharmaceuticals and health products industry employed more than 1,400 lobbyists and spent more than $277 million lobbying the federal government, making it one the strongest special interest groups in our nation’s capital. The industry’s lobbying efforts are spearheaded by PhRMA, which is led by Stephen Ubl, a former biotech executive and lobbyist. From 2011 to 2017, PhRMA spent an average of $19.9 million lobbying the federal government each year. In addition to PhRMA, other industry groups, like the Biotechnology Innovation Organization (BIO), a trade group representing biotech companies, also spend money on lobbying. In 2017, BIO spent more than $9.3 million lobbying the federal government on issues including drug importation, Medicare Part D, the 340B drug discount program, and orphan drugs which are medications for rare diseases. In addition to industry trade associations, individual companies have also invested heavily in lobbying against regulating drug prices. For example, Mylan, a pharmaceutical manufacturer based in Pennsylvania, has reported lobbying on “prescription drug pricing issues,” “issues related to epinephrine auto-injectors pricing,” and an amendment titled “Improving Access to Generic Drugs.” In 2017, Mylan reported a record of nearly $2.7 million in expenditures relating to its lobbying activity, compared to a total of $4.5 million across 2014, 2015, and 2016. According to SEC filings, Mylan views price regulation as a possible risk to its profits. 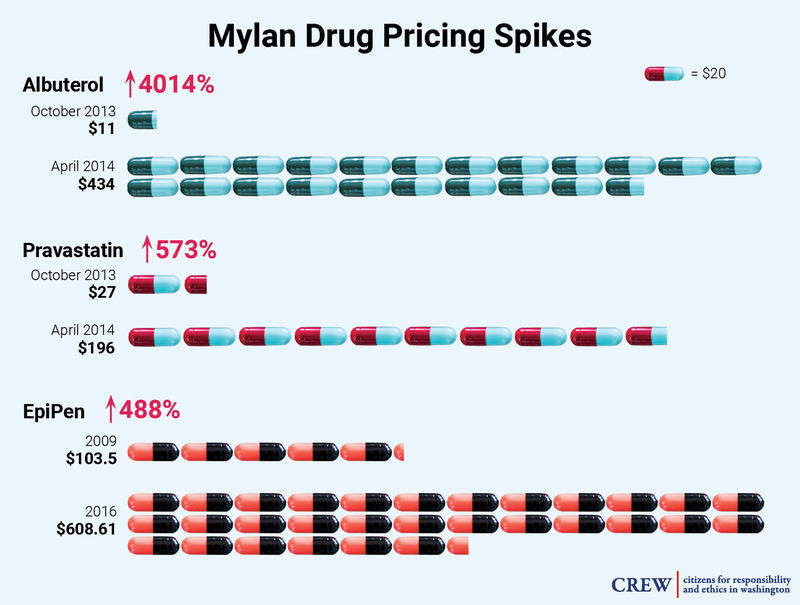 Indeed, Mylan has a notable history of dramatically increasing drug prices. From October 2013 to April 2014, the company increased the price of Albuterol for asthma a shocking 4,014%, from $11 to $434, and raised the price of its heart medication Pravastatin 573%, from $27 to $196, during that same time period. Mylan also raised the price of its cancer drug Aloprim by 100% from December 2014 to February 2016. Mylan came under serious media and public scrutiny in August 2016, after it raised the price of the EpiPen — which injects a dose of life-saving epinephrine to people undergoing severe allergic reactions, and over which Mylan has a virtual monopoly — by nearly 500% over a seven year period. The move sparked a letter of rebuke from Sen. Richard Blumenthal (D-CT), demanding the company lower the price of the EpiPen. Sen. Blumenthal wrote to Mylan that he was “shocked and dismayed to discover that the price of your product, which has not been improved upon in any obvious or significant way, has skyrocketed by 480% since 2009.” Sen. Blumenthal argued that much of the cost increase will ultimately be picked up by local taxpayers, as municipal governments are required to purchase the device for use in schools. In September 2016, members of the House Committee on Oversight and Government Reform held a hearing on this increase, and called for Mylan’s CEO, Heather Bresch, to testify. In the hearing, Ms. Bresch claimed that Mylan does not make a lot of money from the EpiPen, but claimed not to know the exact amount of profit it produces for the company. She also said she did not know how much the company spent on school and patient-assistance programs. Ms. Bresch is the daughter of U.S. Sen. Joe Manchin (D-WV). JUST HOW BIG IS THE DRUG PRICING LOBBY? CREW conducted a search of federal lobbying databases to determine how many companies were lobbying on issues related to drug pricing over the past several years (see Appendix A). For the first three quarters of 2017, CREW found 153 companies and organizations that lobbied on some variation of the term “drug pricing.” This number has more than quadrupled over the past five years. In 2013, only 37 companies reported lobbying on some variation of the term “drug pricing.” That number increased to 52 in 2014, 93 in 2015, and 111 in 2016 (see Table 1). Table 1. 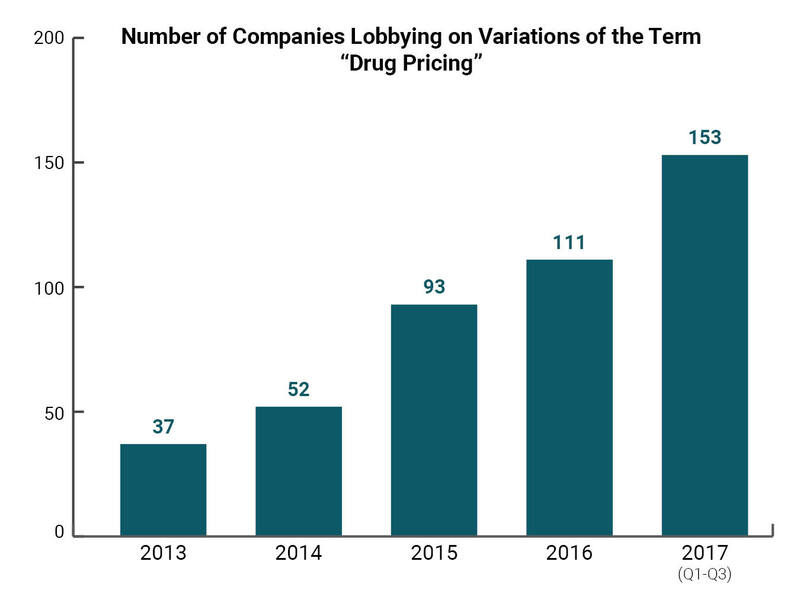 CREW conducted a search of federal lobbying databases to determine how many companies reported lobbying on some variation of the term “drug pricing.” The number has more than quadrupled over the past five years. Twenty-two of Forbes magazine’s top 25 largest drug and biotech companies in the world were found to have lobbied on some variation of the term “drug pricing” during the first three quarters of 2017, including pharmaceutical giants AbbVie, Merck & Co., and Amgen (see Appendix B). For example, Gilead Sciences, a California-based biopharmaceutical company which ranked ninth in Forbes’ survey, spent over $2.6 million on lobbying during the first three quarters of 2017. Gilead is notorious for charging exorbitant amounts for its products. Gilead’s line of hepatitis products which cure the disease — Epclusa ($75,000 per course of treatment) and Sovaldi ($84,000) — have made the company a target for reform advocates. In 2016, the Attorney General of Massachusetts threatened Gilead with possible legal action if the company failed to adjust its pricing. Gilead joined the Massachusetts Biotechnology Council to establish a dialogue with the state’s attorney general on the issue. Collectively, the 22 companies on Forbes’ list that were found to have lobbied on drug pricing issues during the first three quarters of 2017 spent more than $80 million on lobbying during this period (see Appendix B). HOW DOES THE DRUG PRICING LOBBY WORK? The pharmaceutical industry’s lobbying campaign is not restricted to general pricing issues. They also lobby on specific bills that attempt to deal with the problematic costs of prescription drugs. In order to learn more about how Big Pharma’s drug pricing lobby operates, CREW examined three recent attempts at legislation aimed at controlling drug prices: the Prescription Drug Affordability Act of 2015, the Medicare Prescription Drug Price Negotiation Act of 2017, and efforts to regulate orphan drugs. CREW also looked at how Big Pharma utilizes the “revolving door” between government agencies and lobbying firms to push back against new regulations. Overall, CREW found that the pharmaceutical lobby uses a variety of techniques to keep drug prices high, including opposing new legislation, protecting and expanding existing loopholes, and delaying the implementation of new regulations. One of the most ambitious of the drug pricing bills in the last Congress was the Prescription Drug Affordability Act of 2015 (PDAA). Sponsored by Rep. Elijah Cummings (D-MD) in the House and Sen. Bernie Sanders (I-VT) in the Senate, the bill would have allowed the government to negotiate with manufacturers to set prices for Medicare Part D, the federal prescription drug benefit program that covers more than 40 million U.S. citizens. The PDAA would have allowed imports of drugs from Canada and potentially other countries and would revoke the exclusivity periods of certain patented drugs if the manufacturers illegally market or misbrand their products. Additionally, it would have required pharmaceutical companies to annually submit reports to the government detailing how they set prices for their products and the costs of research and development. Finally, the PDAA would have amended the Federal Trade Commission Act to put restrictions on “pay-for-delay” agreements — a tactic in which drug makers pay other companies to not produce lower-cost alternative generics, in effect keeping cheaper treatment options from reaching the market and the patients who need them. Overall, the PDAA would have dealt a serious blow to the pharmaceutical industry’s ability to keep prices high, and many companies and trade groups took notice. PhRMA released a statement on the Sanders-Cummings proposal calling it “short-sighted,” saying it would discourage innovation and “result in fewer treatment options for patients.” In the second quarter of 2016, PhRMA reported lobbying on provisions in the PDAA relating to Medicare Part D negotiation and importation. Unsurprisingly, a number of companies known for price spikes on their products also lobbied on the bill. For example, GlaxoSmithKline (GSK), which from 2011 to 2016 raised the price of its popular asthma treatment Advair by 67%, lobbied on “provisions related to patent settlements” in the PDAA. It also reported lobbying on “provisions related to Secretary negotiation authority in Part D program” in the PDAA. AbbVie and Amgen, both of which are members of PhRMA and have faced criticism for the pricing of their products, also reported lobbying on the bill. AbbVie, which raised the price of Humira, an arthritis medication, by 126% over the last five years, also lobbied on the bill. Amgen increased the prices of Enbrel and Neulasta in 2016 and 2015 respectively and listed PDAA in its 2015 fourth quarter filings as well as “prescription drug value issues” in its filings for the second quarter of 2016. The bill was introduced in September 2015 and referred to the Senate Committee on Finance and the Subcommittee on Health of the House Ways and Means Committee, but it never came up for a vote. Thus far in the current Congress, no members of the House or Senate have introduced a similar bill. One of the most contentious battlegrounds in the drug pricing debate is the possibility of allowing Medicare to negotiate drug prices for its beneficiaries. This is an issue that dates back to 2003, when Congress adopted the Medicare Part D program which included a provision that denied Medicare the right to negotiate drug prices with manufacturers for Medicare Part D patients. The move was largely seen as a generous giveaway to the industry, though major drug makers claim that rebates bring down the costs of many of these products and that most Part D prescriptions are for low-cost generics. In August of 2015, PhRMA published a fact sheet on its website about the topic of Medicare negotiation which claimed that allowing Medicare to negotiate prices would likely result in restrictions of coverage for Part D beneficiaries. However, according to one recent study, U.S. taxpayers could save as much as $16 billion a year if the government could negotiate with drug makers. Polls show that 82% of the general public favors allowing the government to negotiate on behalf of Medicare beneficiaries. During the 2016 election, both then Republican nominee Donald Trump and his opponent, Hillary Clinton, proposed repealing the law. There have been several attempts to amend current law to let the federal government negotiate prices for drugs for Medicare patients. One recent attempt came in early 2017, when Rep. Peter Welch (D-VT) and Sen. Amy Klobuchar (D-MN) introduced identical bills known as the Medicare Drug Price Negotiation Act (MDPNA). (These two lawmakers also sponsored similar bills in 2011, 2013, and 2015). Unsurprisingly, the industry has come out to lobby against it. Several large drug manufacturers have reported lobbying on it since it was introduced at the beginning of the legislative session. For example, PhRMA, AbbVie, and GlaxoSmithKline all lobbied on the bill last year. Like previous attempts at reforming the law, both versions of the bill have been referred to committees, where they remain without action. Another drug pricing-related issue being considered for legislative reform is the treatment of so called “orphan drugs.” Orphan drugs have become a lucrative enterprise for the pharmaceutical industry and have contributed to the drug pricing problem. In 1983, Congress passed a bill to encourage drug companies to develop treatments for rare illnesses known as “orphan” diseases by offering them generous tax credits, accelerated FDA regulatory reviews and more importantly, temporary monopolies for their products. The law has become ripe for abuse. Now many companies will submit a new product for approval under the premise that it helps an orphan disease, but they will later market it for a wider audience beyond the small pool of patients for whom the drug was originally intended. Orphan drugs can grow into “blockbuster” drugs that patients overpay for and that are also subsidized by taxpayers. For example, blockbuster medications like AstraZeneca’s popular cholesterol drug Crestor and AbbVie’s best-selling arthritis treatment Humira, which took in $5.2 billion and $14.1 billion in sales in 2015 respectively, have both been granted the orphan drug indication. Additionally, the prices of both drugs increased in recent years, Humira going up 126% from 2011 to 2016 and Crestor jumping 15% in 2016 alone, ahead of the introduction of a generic form of the drug. Seven out of the top ten selling drugs in the U.S. are now orphan drugs, and in 2016 more than 40% of new FDA-approved drugs were classified as orphans. They can cost nearly five times as much as non-orphans. As a result, orphan drugs bring in billions of dollars in revenue for their manufacturers. Big Pharma has made extending orphan drug designations an important lobbying goal. In 2017, industry groups like BIO and PhRMA, and firms with troubling pricing practices like GlaxoSmithKline and AbbVie reported lobbying on issues related to the term “orphan drug.” For example, the drug companies Sanofi and Vertex reported lobbying on the “Orphan Product Extensions Now Accelerating Cures and Treatments Act of 2017” (OPEN Act) sponsored by Sen. Orrin Hatch (R-UT) and Rep. Gus Bilirakis (R-FL). This bill would grant an extension of the exclusivity period for old drugs if they have been approved for new uses in orphan diseases, allowing abuses of the current Orphan Drug Act to continue unchecked. As of January 2018, the bill has been referred to the Senate’s Health, Education, Labor and Pensions Committee, but has not yet moved further. Another way that the pharmaceutical industry utilizes lobbyists to push back against new drug pricing regulation is via the “revolving door” between government agencies and lobbying firms. For example, Merck & Co. enlisted the help of a lobbyist with connections to now former Secretary of Health and Human Services (HHS) Tom Price to score victories for the industry. Prior to joining HHS, Price served in the U.S. House of Representatives for 12 years, representing the 6th congressional district of Georgia. CREW discovered that during the first six months of Sec. Price’s tenure at HHS, three of his former congressional staffers lobbied HHS on several issues including drug pricing. Matt McGinley, who served as then Rep. Price’s chief of staff from 2005 to 2011, may be the most notable of these lobbyists. Mr. McGinley now runs his own lobby shop known as Advanced Policy Consulting and lobbied on behalf of Merck & Co., PhRMA, and Amgen last year. In 2017, he disclosed “advocating for market based solutions to bring [down] the cost of drug prices,” and also reported lobbying on the 340B drug discount program. In May, Sec. Price approved a rule delaying a new regulation relating to the 340B Ceiling Price Rule, which would have required drug companies in the Medicaid program to provide rebates to certain health clinics if they overcharged for medication. The drug industry embraced the delay as an opportunity to push for additional changes to the regulation. Another way the revolving door is helping the pharmaceutical industry is the hiring of former pharmaceutical lobbyists to key policy positions in the government. In June, The New York Times reported that President Trump had hired Joseph Grogan, a former top lobbyist for Gilead, to work on prescription drug policy. Mr. Grogan was registered to lobby for Gilead as recently as the first quarter of 2017, and reported lobbying on the 340B drug discount program, as well as “coverage of pharmaceuticals, cost-sharing and other access issues; issues related to coverage and reimbursement of pharmaceuticals.” In May 2018, Politico reported that Mr. Grogan’s work on drug pricing may have violated the White House’s rule that requires a two-year cooling-off period for former lobbyists working on issues in which they lobbied in the past. Mr. Grogan never received a waiver from ethics officials to work on drug pricing issues, nor has he filed an ethics agreement detailing how he would recuse himself from potential conflicts of interest. 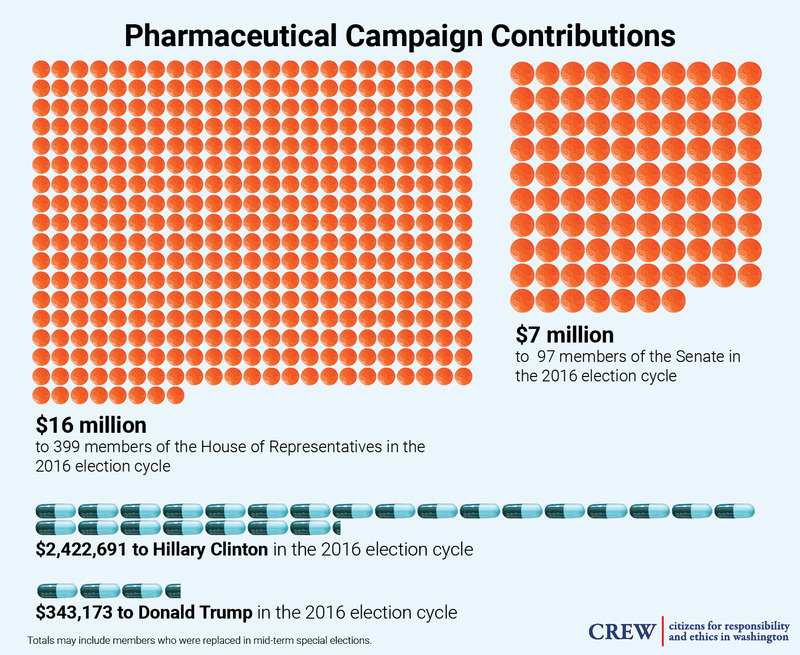 In addition to lobbying, Big Pharma uses two other key tactics to influence policy and public opinion: public relations and campaign spending. In the summer of 2016, PhRMA began adding new members to its ranks and charging more for dues in an effort to beef up its coffers for election year. The group also launched a multi-million dollar public relations campaign highlighting the merits of the pharmaceutical industry. According to Politico, the industry’s K Street lobbyists want to take control of the drug pricing narrative and emphasize that they are not solely responsible for out of control costs. BIO has also launched a PR campaign to change public perception of the industry in regards to drug costs. The campaign — “Innovation Saves” — kicked off in September 2016 and produces ads featuring patients who have benefitted from innovative treatments from the biotech field. BIO is run by James Greenwood, a former member of the U.S. House of Representatives. In an interview about “Innovation Saves,” Mr. Greenwood blamed the health insurance industry for its role in making medications unaffordable for patients and claimed that the high prices are only temporary because most products become subject to generic competition after a short time. He also warned of unspecified “ham-handed policies” that could stifle innovation. In October 2016, BIO released a YouTube video titled “Understanding Your Drug Costs: Follow the Pill,” which largely blamed insurance companies and pharmacy benefit managers for marking up prices. It stressed that patients rarely pay the list price of pharmaceutical products and the manufacturer’s profits are often watered down by the complex coverage process. The industry also supplements its lobbying activity by giving generous campaign contributions to Capitol Hill politicians. According to Open Secrets, during the 2016 election cycle, the industry gave over $16 million to 399 members of the House of Representatives, an average of more than $40,000 per member. They also gave more than $7 million to a total of 97 senators, at an average of roughly $75,000. During the 2016 presidential election cycle, the industry contributed more than $2.3 million to Hillary Clinton’s campaign, while also giving $343,000 to the Trump campaign. While Trump talked tough on the drug pricing issue while out on the campaign trail, a stock analyst told Bloomberg that the president’s approach to the problem once in office was a “pretty industry-friendly scenario.” Last year, The New York Times obtained a leaked document detailing the president’s proposal to tackle the drug pricing problem. Reportedly, the proposed orders did not specifically address how to lower prescription drug prices, but were predominantly aimed at rolling back regulations, a solution that the industry claims is the best way to bring prices down. Furthermore, the document reportedly proposed changes to the 340B drug discounting program — a significant giveaway to the industry that could actually raise prices for thousands of low-income consumers. In May 2018, the White House finally released a “blueprint” report that laid out how the administration would take on the issue of drug pricing. In a speech accompanying the rollout, President Trump largely blamed high prices on a “broken system” of special interests which includes drug manufacturers, distributors, insurance companies and pharmacy benefit managers. Drug policy experts, however, were quick to point out that the president’s actual policy proposals do not require the pharmaceutical industry to change its behavior, and would do little to bring down prices. The pharmaceutical industry has made a fortune by increasing the prices of medications that are critical for the health and well-being of millions of Americans. As the federal government attempts to address this issue, Big Pharma has shown that it will use its considerable resources to lobby against any reform efforts perceived as a threat to its bottom line. While it remains to be seen whether the government will be able to find a solution to rein in drug prices, the drug industry is sure to do everything it can to stop them. CREW explored the changing size of the drug pricing lobby by examining lobbying records for mentions of drug pricing and other similar search terms over the past five years. It is important to note that lobbying reports may use a variety of additional terms that touch on the drug pricing issue, but do not contain the exact term “drug pric-” — for example, “drug costs,” “drug reimbursement” or “cost of pharmaceuticals.” Since CREW’s search methodology did not include these additional terms, our count of the number of organizations lobbying on this issue should be interpreted as a low-end estimate. The actual number of firms lobbying on drug pricing is likely much higher. After identifying all firms that had reported lobbying on “drug pricing” and similar terms over the past five years, CREW focused on lobbying by firms listed on Forbes Magazine’s 2016 list of the top 25 largest drug and biotech companies in the world during the first three quarters of 2017. This list included 22 foreign and U.S. drug companies, as well as three pharmaceutical distributors: McKesson, Cardinal Health, and AmerisourceBergen. CREW ran searches on the Senate’s Lobbying Disclosure Act Database with each of these 25 firms in the “Client” field for the first three quarters of 2017. Each lobbying report was reviewed for language that indicated lobbying on the drug pricing issue. In addition to “drug pricing” and similar terms, relevant terms included “affordable drugs,” “pharmaceutical development and pricing,” and “price controls on drugs.” If a firm was found to have lobbied on one or more of these terms during the first three quarters of 2017, it was included in our count of large drug and biotech companies found to have lobbied on drug pricing. For those firms included in this count, CREW also calculated the total amount of money spent on federal lobbying during Q1-Q3 of 2017, using quarterly reports available at https://www.opensecrets.org/. While these figures reflect total lobbying by each firm, not just lobbying on the drug pricing issue in particular, they are included to provide a sense for each firm’s overall influence in Washington. CREW also searched for the term “drug pric” in lobbying reports from 1999-2012. Although less prevalent overall, use of the term also spiked in 2005, possibly due to debates over Medicare Part D, and fell sharply again after 2008. Nevertheless, the increase between 2013 and 2017 is both the longest sustained increase over time, and the largest in terms of actual numbers of companies, since at least 1999. It should be noted that this refers to the U.S.-based Merck & Co., not Merck KGaA which is an unrelated company based in Germany that was ranked #19 on Forbes’ list. Open Secrets indicates that this data may contain contributions that went to House and Senate members who did not finish their terms and were subsequently replaced in special elections. As a result, these numbers may include members who are no longer in office.